Spell out your love for mom with gifts that matter this Mother’s Day and do good at the same time! 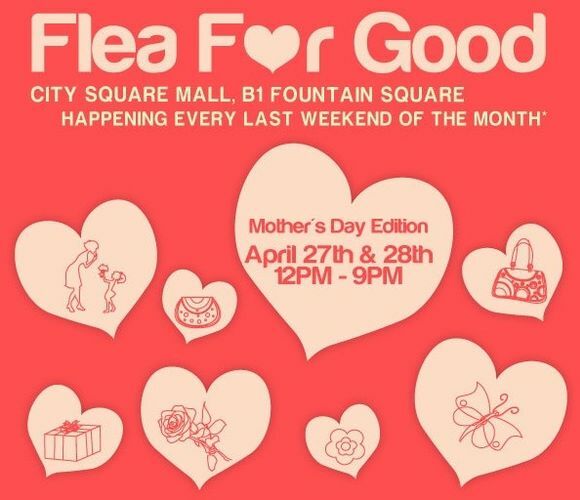 City Square Mall will be holding its second edition of Flea For Good, a series of flea markets for charity, with its upcoming Mother’s Day edition held on 27th and 28th April at City Square Mall’s Fountain Square on Basement 1. Happening every last weekend of the month except in June, Flea For Good hopes to promote various social causes while encouraging shoppers to shop with a heart. A portion of proceeds collected from booth rentals will be donated to the Singapore Children’s Society for their work with needy children and disadvantaged families. With close to 30 participating vendors, Flea For Good offers bargain hunters and handicraft lovers a wide range of affordable interesting trinkets and pre-loved products. There will also be booths by social enterprises, non-profit organisations and beneficiaries. As part of City Square Mall’s eco-friendly practices, vendors are encouraged to provide customers with reused paper or plastic bags whenever they make a purchase. This helps to reduce packaging waste and encourage people to adopt recycling habits. Vendors are also encouraged not to dispose unsold or unwanted items that are still in good condition. Instead, Flea For Good will serve as the collection point for these items which will be delivered to various beneficiaries. All items will be screened upon collection to ensure that they are in good condition.